Daily max (24 hrs) - $14 (up to 30 days). Follow the yellow triangles to the /Passenger Pick-Up curb, located across the pedestrian bridge from baggage claim. This area is designated for immediate loading only. Unattended vehicles will be towed. Short-term metered parking is also available in this area. 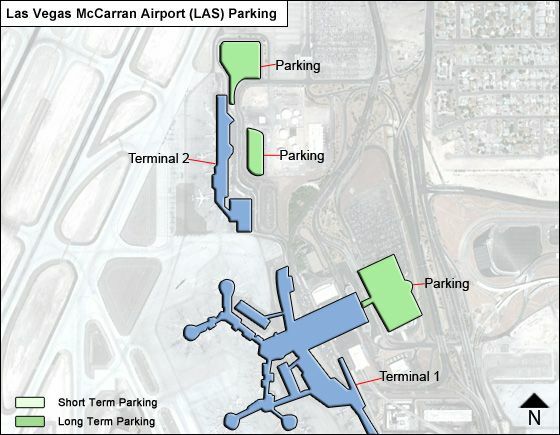 Follow the roadway signs to "Departing Flights" to drop off passengers at McCarran. The Departures curb is for immediate drop off of passengers only. No waiting/unattended vehicles. Follow the red triangles to Short -Term Parking located on Level 2M of the public parking garage. Height Clearance: 7' 0". Follow the yellow triangles to additional short-term parking located on Level 1. All short-term parking is limited to 3 hours. Parking in designated handicapped spaces is limited to 4 hours. Fees are paid in advance through a parking meter (quarters only). Change machines are located in all short-term parking areas and are identified by green flashing lights. Height Clearance: 8' 2"
Follow the green triangles to Long Term Parking located on Levels 1M, 2M, 3, 4, 5, and 6 of the public parking garage. Fees are paid at the tollbooth upon exit. When Long-Term Covered Parking is full, follow signs to Economy Parking located on Russell Rd. at Kelly Lane. Follow the red triangles to Valet parking located on Level 2 of the public parking garage. Service is available 24 hours a day, seven days a week. A 148-space uncovered parking lot is available for patrons at Terminal 2. All parking fees must be pre-paid, cash only, at a pay station. Phones are located at the Prepay stations for your convenience. Courtesy shuttle service operates approximately every 10 -15 minutes to transport passengers between Economy Parking and Terminal 1. Red overflow and remote parking lots are used at the Airport's discretion on an as-needed basis. Call 702-261-5122 for live updates on which garage and lots have available spaces. Where at Terminal 3 to park and wait for foreign arrival passengers?